Purpose: Gemcitabine in low-dose prolonged infusion is a treatment with documented activity against a variety of tumors. The present study was conducted to evaluate the efficacy and safety of the combination of gemcitabine at a low-dose prolonged infusion in comparison with standard dose gemcitabine with carboplatin in chemonaive patients with advanced non-small cell lung cancer (NSCLC). 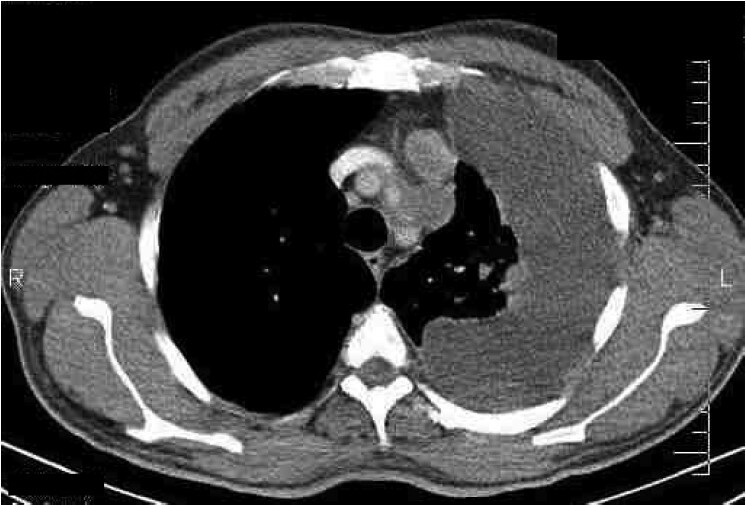 Materials and Methods: Sixty chemonaive patients with stage IIIB or IV NSCLC were included. Patients were randomly assigned 1:1 to receive 350mg/m 2 gemcitabine in a 6-h infusion on days 1 and 8 and carboplatin area under the serum concentration time curve (AUC) 5 on day 1 versus gemcitabine 1000mg/m 2 on days 1 and 8 and carboplatin AUC 5 on day 1 (3-week cycle both). A total of 118 chemotherapy cycles, with a median of 4 cycles per patient (range 2-6), and 134 chemotherapy cycles, with a median of 4.47 cycles per patient (range 3-6) were administered in standard and low infusional dose arm, respectively. Results: Among patients in the standard arm, 40% had overall response rate (ORR), 33.3% had stable disease and 26.6% had progressive disease, while in low-dose infusional arm, 36.6% had ORR, 36.3% had stable disease and 26.6% had progressive disease (P = 0.992). 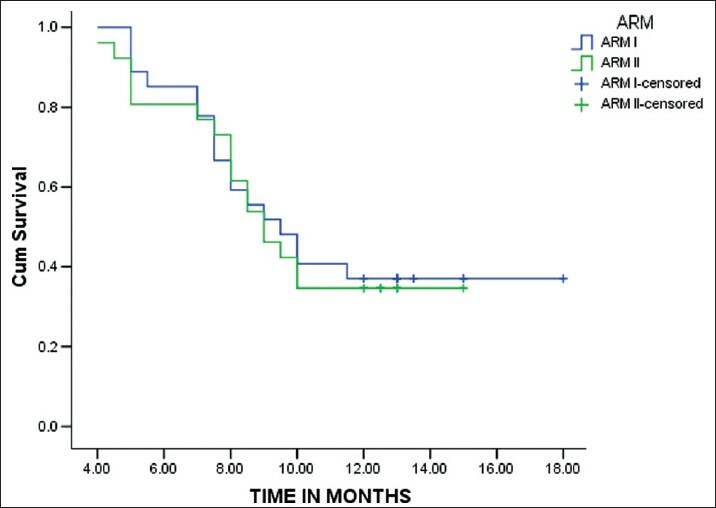 Median progression-free survival was 5.5 months and 5.4 months, median overall survival was 9.7 months and 10.7 months, and 1-year survival was 33.7% and 36.6% in standard arm and low-dose infusion arm, respectively. Grade 3/4 toxicity was rare. Conclusion: In NSCLC, gemcitabine low-dose prolonged infusion with carboplatin has low toxicity, especially thrombocytopenia, and has an activity comparable with gemcitabine given in higher dose in standard infusion. Background: Oronasal communication occurs after total maxillectomy for advanced sinonasal cancers. This results in feeding, breathing and cosmetic impairment. Various methods have been described to close off the palatal defect from the oral cavity to improve the function of speech and deglutition. Aims: The object of this article is to describe our experience of preservation of palatal mucoperiosteum for oronasal separation. 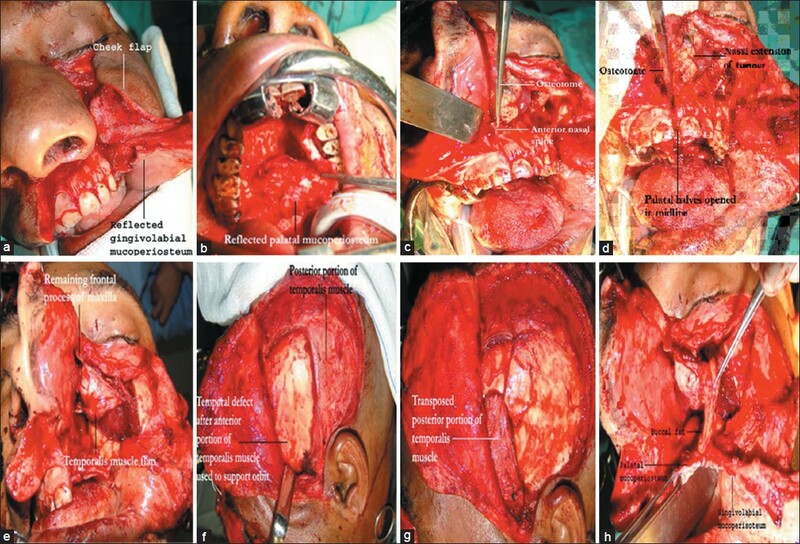 Materials and Methods: Retrospective review of clinical and operative records of 31 total maxillectomy patients where oronasal separation was achieved by the conventional technique of applying a maxillary obturator. The postoperative complications arising from the use of maxillary obturator for oronasal communication after total maxillectomy in these 31 patients were analysed. To avoid the complications encountered in these 31 patients we preserved and used the ipsilateral palatal mucoperiosteum for oronasal separation. This new technique was applied in 12 patients. The results are presented and compared. Results : A total of 43 patients underwent total maxillectomy for advanced sinonasal tumors. In 31 patients the conventional maxillary obturator was used for oronasal separation. Among these patients, 30 had crustation of the maxillary cavity, nasal regurgitation and cheek skin retraction in 15 each, trismus in eight, infection of skin graft donor site in seven, cheek movement during respiration in five and ill-fitting prosthesis in three. In 12 patients palatal mucoperiosteum was preserved and used for oronasal separation. The complications encountered in oronasal separation by palatal prosthesis were avoided in the modified procedure. Conclusions: We found that oronasal separation by preservation of palatal mucoperiosteum following total maxillectomy allowed excellent palatal function, prompt rehabilitation and minimal complications without compromising the prognosis. Objective: To define the demographic risk profile and stage at diagnosis among the head and neck cancer (HNC) patients reported in two hospital-based cancer registries in Andhra Pradesh. Materials and Methods: A cross-sectional study was conducted in patients with histologically confirmed diagnosis of squamous cell carcinoma of the head and neck during 2002-2006. Data on the demographic profile and clinical information were obtained from hospital and clinical records. Staging was based on the American Joint Committee on Cancer and included primary tumor size (T), regional neck status (N), and group stage. The site of cancer was classified based on the International Classification of Disease for oncology (ICD-02). Results: A total of 5458 cases of HNC were included in this study. Majority of the subjects were in the age range of 40-69 years with a significant male preponderance in all the age groups (P<0.001). The most common habit was the combination of smoking, alcohol, and chewing in both males and females (20.1 and 35.1%, respectively) (P<0.001). Tongue and buccal mucosa were the most common sites of cancer in both males (26.8 and 12.8%, respectively) and females (22.9 and 19.8%, respectively) (P<0.001). Tongue was the commonest site of cancer occurrence with respect to all the habits (both singly and in combination) except for chewing tobacco where buccal mucosa was the most common site. Males were more likely to be diagnosed in stage 3 (37.6%) and 4 (20.6%), while females were diagnosed in stage 1 (36.3%) and 2 (32.7%) (P<0.001). Conclusion: A male preponderance of cancer occurrence and combination of all the three habits (smoking, alcohol, and chewing) were found to be the significant risk factors. Males were more likely to be diagnosed later than females. Aims: To report the outcome with radiotherapy and concomitant chemoradiotherapy in patients with locally advanced squamous cell carcinoma base of tongue treated and followed up at single institution over a period of 15 years. Materials and Methods: This study was carried out by auditing the medical records of 103 patients treated at our institution between 1991 and 2006. Mean age with standard deviation of patients in the Radiotherapy only (group I) and chemoradiotherapy (group II) was 55.26 ± 14.16 and 49.81 ± 12.16 years. 46 patients were treated with radiotherapy alone and 57 patients were treated with concurrent chemo radiotherapy using infusion cisplatinum 3 weekly and 5 fluorouracil twice weekly. Mean follow up was 13.35 months. All the patients characteristic and treatment characteristics were recorded. Results: There were 81 men and 22 women in the study. Group I contains 15 and 31 cases of stage III and IV tumors while group II contains 19 and 38 cases of stage III and IV respectively. Group II has shown improved loco regional control rate for the T3 and T4 tumors as compared to group I. Disease free survival and overall survival in the group II is 25.51 months and 22.53 months while group I has 8.67 months and 6.74 months respectively. Grade III mucosal toxicity incidence was higher in group II as compared to group I. 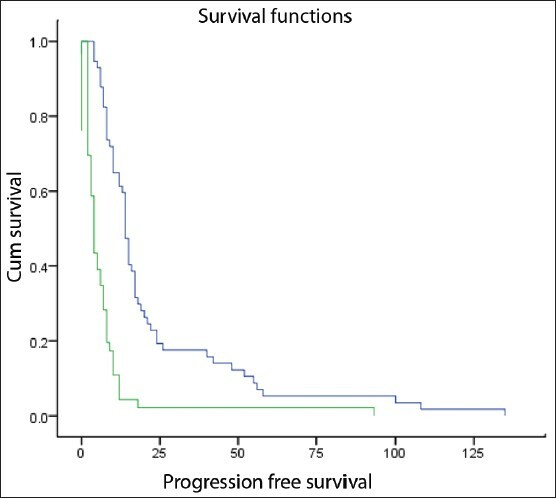 Conclusions: In locally advanced squamous cell carcinoma of base of tongue tumors concomitant chemoradiotherapy with infusional cisplatinum and 5 fluorouracil results in higher disease free and overall survival as compared to radiotherapy as single modality. This better tumor response with chemoradiotherapy comes at cost of higher incidence of mucosal toxicity. Background: Multimodality treatment of head and neck cancer in rural India is not always feasible due to lack of infrastructure and logistics. Aim: To demonstrate the feasibility of multimodality treatment for head and neck cancer in a community setting in rural India. Setting and Design: Community cancer center, retrospective review. Materials and Methods: This article focuses on practice environment in a cancer clinic in rural India. We evaluated patient profile, treatment protocols, infrastructure availability, factors impacting treatment decisions, cost estimations, completion of treatment, and major treatment-related complications for the patient population treated in our clinic for a 2-year period. Results: A total of 230 head and neck cancer patients were treated with curative intent. Infrastructure support included basic operating room facility (cautery machine, suction, drill system, microscope, and anesthesia machine without ventilator support), blood bank, histopathology laboratory, and computerized tomography machine. Radiation therapy (RT) facility was available in a nearby city, about 75 km away. One hundred and fifty-four (67%) patients presented at an advanced stage, with 138 (60%) receiving multimodality treatment. One hundred and eighty-four (80%) patients underwent primary surgery and 167 (73%) received radiotherapy. Two hundred and twelve (92%) patients completed the treatment, 60 (26%) were lost to follow-up at 18-month median follow-up (range 12-26 months), with 112 patients (66%) being alive, disease free. Totally 142 were major head neck surgeries with 25 free flap reconstructions and 41 regional flaps. There were 15 (6%) major post-op complications and two perioperative mortalities. Average cost of treatment for single modality treatment was approximately 40,000 INR and for multimodality treatment was 80,000 INR. Conclusions: This study demonstrates that it is feasible to provide basic multimodality treatment to head and neck cancer patients in the community. Aim of Study: To assess the effect of strictly local treatment [intraarterial chemotherapy (iaCHT) with high-dose cisplatin and parallel neutralization] in the primary oral and oropharyngeal cancer (OOSCC) on the dependent cervical lymph nodes. Patients and Methods: Seventeen consecutive patients with OOSCC and clinically positive necks underwent a prospective blinded comparison of two pre-surgical fluor18-deoxyglucose (FDG)-positron emission tomography (PET) examinations: baseline examination 1 week before and follow-up examination 3 weeks after iaCHT. Maximal standardized uptake (SUVmax) values of lymph nodes were measured and compared with each other and histopathology. Results: The SUVmax value of the primary and all neck lymph nodes with uptake decreased significantly. Twelve/17 patients having metastases revealed significant decrease (P = 0.03), and benign lymph nodes showed non-significant decrease of the SUVmax. All neck lymph nodes with uptake and nodal metastases showed a significant reduction (P = 0.004) of standard uptake values (SUV). Conclusion: A regional effect of intraarterial cisplatin is proven. To date, it is not clear whether this is due to decreasing inflammatory reaction or a translymphatic anti-neoplastic effect. Objective: To identify the risk factors of esophageal cancer and study their effect on the survival rates patients of Jammu region, India. Materials and Methods: Detailed information was collected on socio-demographic, dietary and clinico-pathological parameters for 200 case control pairs. Discrete (categorical) data of 2 independent groups (control and cases) were summarized in frequency (%) and compared by using Chi-square (χ2 ) test. The mean age of two independent groups was compared by independent Student's t-test. To find out potential risk factor (s), the variable (s) found significant in univariate analysis were further subjected to multivariate logistic regression analysis. The association of potential risk factors with patients survival (3-year overall survival) was done by Kaplan-Meier survival curve analysis using Log-rank test. A 2-tailed (a = 2) P < 0.05 was considered statistically significant. Results: Out of the 63 response parameters, seven were found highly significant on multivariate analysis. The mean (± SD) age was 56.74 ± 10.76 years, the proportions of males were higher than females, mostly illiterate and lower income group. Among dietary characteristics, snuff was highest (OR = 3.86, 95% CI = 2.46-6.08) followed by salt tea (OR = 2.53, 95% CI = 1.49-4.29), smoking (OR = 1.97, 95% CI = 1.18-3.30), sundried food (OR = 1.77, 95% CI = 1.10-2.85) and red chilly (OR = 1.76, 95% CI = 1.07-2.89). 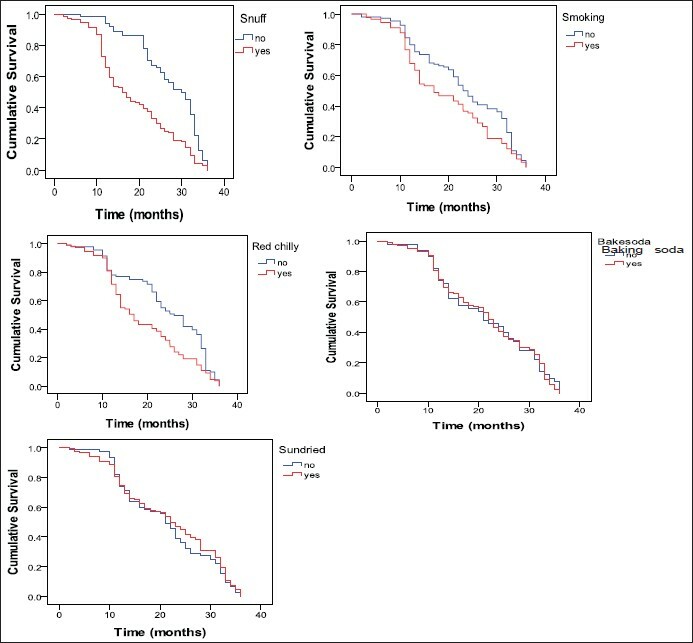 Probability of survival lowered significantly (P < 0.05 or P < 0.01 or P < 0.001) in those consuming tobacco in the form of snuff (Log-rank c 2 = 24.62, P = 0.000) and smoking (Log-rank c 2 = 5.20, P = 0.023) as compared to those who did not take these. Conclusions: The analysis finally established snuff (smokeless tobacco) as the most powerful risk factor of esophageal cancer in Jammu region, followed by the salt tea, smoking and the sundried food. Background: Gastric carcinomas are common malignancies in southern India and distal stomach remains the commonest site in low socio economic groups. Surgery still remains an important modality of treatment to achieve local control and also relieve obstructive symptoms. In this study we investigated the feasibility of performing a gastrectomy and billroth-1 type of anastomosis in a rural cancer center setting, with parameters like adequacy of margins, ease of anastomosis and its functional results were analysed Materials and Methods: Eight patients presenting to a rurally based cancer center underwent a distal gastrectomy and billroth-1 type of anastomosis for continuity restoration Results: All the patients had adequate proximal and distal marg. The surgical time varied between-hrs. The anastomosis was constructed without any tension on bowel ends in all patients. The average time to start oral feeds varied between- None of the patients showed symptoms of bile reflux nor dumping. The average hospital stay varied between- Conclusions: Billroth-1 anastomosis is a physiologically more natural way of restoring continuity following a gastrectomy and it is a procedure which would be technically more simpler and decrease per and post operative complications and allow speedier post operative recovery following surgery on distal gastric cancers.